"It's not goodbye, just see you around"
This marks the final post of my year in France. Although it's honestly really difficult to write this post, it's something that I feel that I must to in order to conclude this year. This past week in Châtellerault has been the most amazing week of my life. In saying good-bye to everyone, I was able to have some time to reflect on this amazing year and how it was impacted by everyone who I met along this journey. I am very grateful for everyone who made my year incredible. I am indebted to my family, the Roure family: Gilles, Anne-Cécile, Marine, Mathilde, Elise, and Louis. They went above and beyond their role as a host family and cared for me like I'd always been apart of the family from the start. Each one of them supported me one way or another during this year. This is truly an exceptional family. I feel honored to have been given the opportunity to be apart of their family. Secondly, I want to thank all of my friends that I've made here in France. Whether you come from Iceland, Argentina, Norway, Denmark, Brazil or even if your "simply" French. Thanks to you- this year has been Magnifique! Within one year, I have made friendships that are truly unforgettable. I cherish every the moment we've spent together- whether it be au café, at a soirée, in class, or at handball practice. I'll be leaving tomorrow, however I'm sure that these relationships will last a life time. Thank you for sharing your perspectives, whether you knew it or not you opened up the world for me. You all taught me to have confidence in myself and really challenged me to be my best. Each and everyone of has impacted me and helped shape me into the person I am today. When given the opportunity, I cannot wait to come back to France and see you all again. Lastly, I'd like to thank my family back in the US. Congratulations! You've waited patiently for a year and it's paid off- Tomorrow, I'll finally get to see you. :) Even from the other side of the world, you supported me my dream. Being half a world away from you guys made me realize how you you mean to me. In being far away from you, I actually feel closer than ever. Merci pour tout! We had dinner at a crêperie to celebrate my last night in France. A crêpe with goat cheese, tomatoes, and honey! Yum! 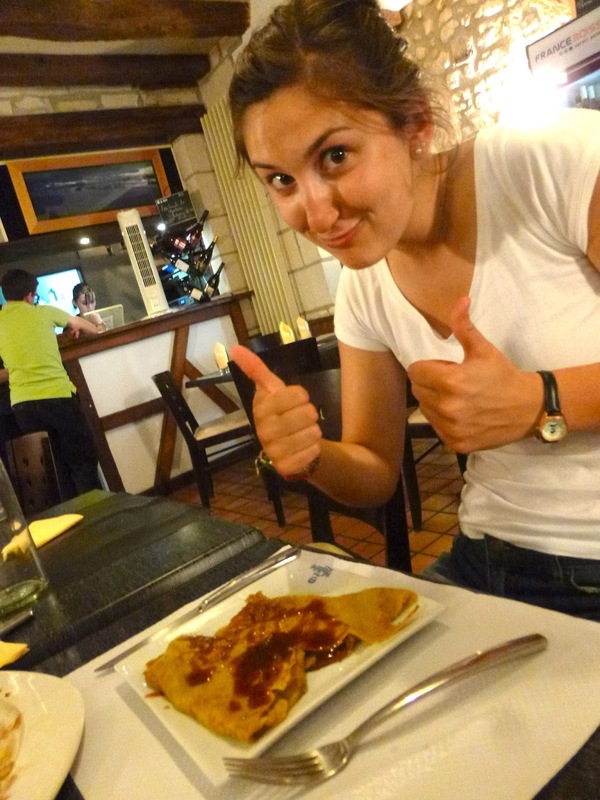 Once they heard that it was my last night in France, they let me make a crêpe! It wasn't nearly as easy at it looked. One final stop at Monoprix!